Easy Flat-Front Skirt Sewing Tutorial - Make It in One Afternoon! This easy flat-front skirt sewing tutorial can be made for a young girl, teen or woman! You’ll just need the model’s waist and hip measurement, some woven fabric and a bit of elastic. It’s easy enough for a very beginning sewer but fun and versatile enough for anyone’s wardrobe! It’s a great outfit basic for a spring or summer look and makes getting dressed a breeze. Read on for the full DIY instructions. I’m excited to share today’s tutorial with you all! If you saw my Spring/Summer capsule wardrobe post last week, then you’ll recognize this peach pencil skirt. We’re gonna learn to make it today! 2. I wanted a flat-front waistband to eliminate bulk. I just love the tailored look of this style. 3. It had to be lightweight for summer but knee-length. **This skirt fits over my 39″ hips (bottom) with plenty of movement, but if you’re significantly smaller or larger than me, you’ll want to subtract or add some to the width (35″). 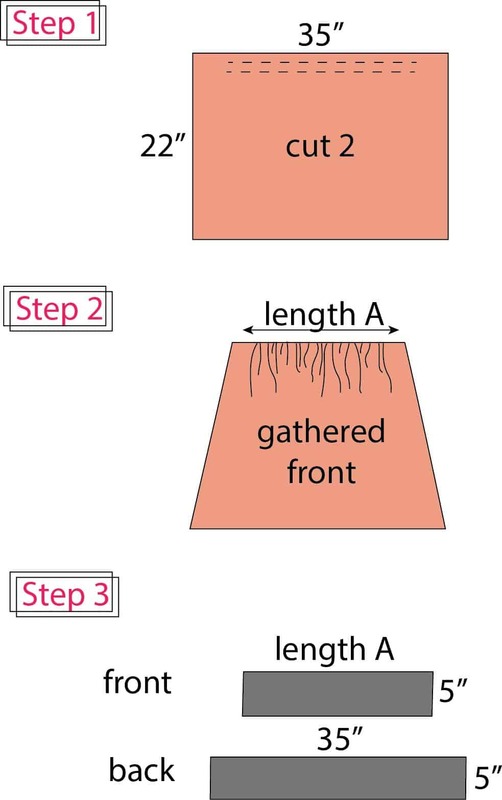 STEP 1: Cut your front and back skirt pieces. My fabric was 44″ wide, so I cut it it down to 35″ long, then cut it in half again to get two pieces measuring 35″ x 22″. Run 2 parallel gathering stitches along the top of one piece (this will be your front). If you start and stop your gathering stitches about 3-4″ away from the sides, this will reduce the look of bulk around your hips. I cut 2 rectangles, each measuring 7.75″ x 9″, then pressed the raw edges under on all 4 sides. I then topstitched along one short end (the top of pocket) and finally pinned and stitched along the other 3 folded edges, attaching it to the front skirt piece. STEP 2: Pull your gathering threads until your skirt front is as wide as half your waist measurement + 1.5″ for seam allowances. For example, if your waist is 30″, you’ll gather your front piece until it is about 16.5″ wide (30/2 = 15; 15 + 1.5 = 16.5). Make note of this measurement, it is “length A” in the next step! NOTE: After trying my skirt on, I didn’t love the gathering on my body so I ended up taking it out. Then I cut my front piece down to 17″ wide at the top, with the bottom just slightly wider (about 20″). It’s up to you which look you prefer! STEP 3: Cut your waistband pieces. Your FRONT band will measure: length A (i.e. 16.5″ from the example) x 5″. Your BACK waistband will be 35″ (or the width of your back piece) x 5″. Next, stitch your skirt pieces together along the side seams (the 22″ sides) and the waistbands together along the 5″ sides; press seams. Fold the waistband in half lengthwise, WRONG sides together. You will have a big circle with a fold down the center. STEP 4: Lay your skirt flat, right sides out, with the BACK facing you. Slip your waistband circle over the top of the skirt, with the fold down and raw edges up. 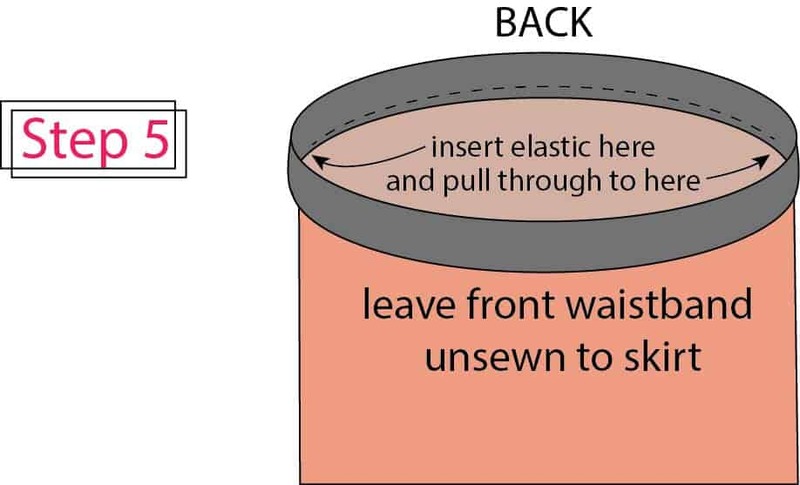 Making sure the BACK waistband piece is touching the BACK skirt piece, line up the raw edges of your skirt and waistband and pin together, matching up side seams. Stitch waistband and skirt together; press seam and neaten raw edges. **Leave the front waistband UNSEWN to the skirt at this point! STEP 5: Flip your skirt around so that the front is facing you. 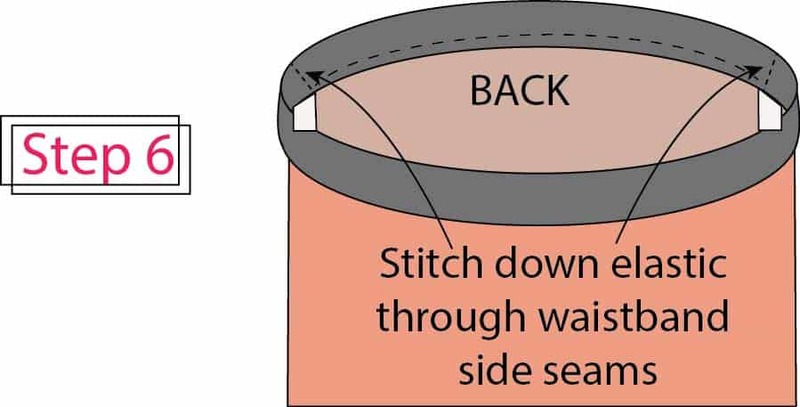 Cut your elastic to about 1/2 your waist measurement (it stretches so no need to be exact!) and then insert it into the waistband casing you just created in step 4. Pull it all the way through the back waistband until it comes out the other side (near the side seam). Pin place and try your skirt on! Adjust elastic as necessary. STEP 6: With the raw ends of your elastic sticking out of the casing, stitch through the waistband and elastic right on top of the side seams. This secures your elastic in place! Now, flip your waistband down over the outside of skirt again and stitch the front skirt to waistband. Press and neaten raw edges. Hem to desired length and voila – all done! **Quick question! When it comes to tutorials, do you prefer illustrated instructions like these, or step-by-step color pictures? They each have their redeeming qualities and I can’t decide! If you have an opinion, please weigh in, thanks!! Don’t you just wanna steal my sister’s pretty blue front door?? I do! Looking for another skirt sewing tutorial? This reversible one is a little more complex but amazing to wear and twirl in! I also love this button front skirt. I prefer real life step-by-step color pictures every since I had a stroke. Thank you very much for asking. Some instructions I can’t visualize in my mind. I want to make this skirt so bad, I’m willing to try now, though. And I do love the door! Thanks for letting me know Dianne! They are easier for me too…it’s too bad they take so much more time to create! I hope you do try it! I’m confused about the length of the waistband? I’m making a Skirt for a 3 year old, Waist is 20”. How wide should the waistband be for a half Elasticated waistband? Hi Diane! The front waistband will measure about 10″ long (half her waist measurement) and the back portion will measure the width of your back skirt piece (probably around 20″ or so, depending on how gathered you want it to be). Then when you insert your 10″ elastic into the back casing, it will gather up the back portion of the skirt fabric nicely. Hope that makes sense! Excellent, thank you for your help .